eGo Battery 650mAh 510 Manual Rechargeable Lithium Battery. The eGo uses a 650mAh manual battery. This gives a heavy user at least 6-7 hours of vaping. 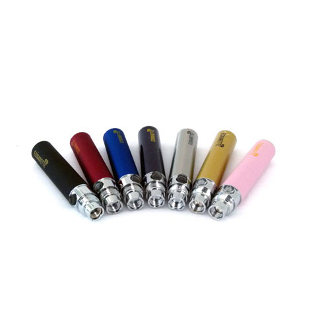 The eGo Battery is compatible with all ego clearomizers and 510 atomizers. The eGo Battery 650mAh features a safety function that allows you to turn off the battery. To place the battery in or out of locked mode, press the button 5 times within 2 seconds. The LED will flash indicating you have changed modes. Please select your ego battery color from the drop down menu. Colors currently available are white, silver, black, and pink.